Two of the four emergency shelters that were opened for residents will remain open overnight. The Cambridge and Pearson centers will remain open. You can bring your pets with you at the Cambridge shelter. UPDATE 4 P.M. AUG. 13: Clark County is closing the Cambridge Center shelter at 5 p.m. The last person in the shelter has left after his power was restored. Fewer than 700 customers remain without power. UPDATE 11 A.M. AUG. 13: Clark County reports fewer than 1,000 customers are without power after Saturday's storm. The Clark County Fire Department’s Office of Emergency Management is closing the Pearson Center shelter but the Cambridge shelter remains open at 3930 Cambridge Street until further notice. UPDATE 5 A.M. AUG. 13: 1,771 customers are still without power. UPDATE AT 2:45 P.M. Approximately 9,000 customers are still without power. Two of the four emergency shelters that were opened for residents will remain open overnight. The Cambridge and Pearson centers will remain open. You can bring your pets with you at the Cambridge shelter. The American Red Cross volunteers are helping families who are looking for a more comfortable place to sleep tonight following a massive power outage. Christine Kramer with the Red Cross reminds people who are seeking shelter, "Do bring your medications. Bring pillows if that makes you more comfortable to sleep. Don't bring a lot of things because you are going to be in a shelter." There's still damage across the valley from those strong storms. 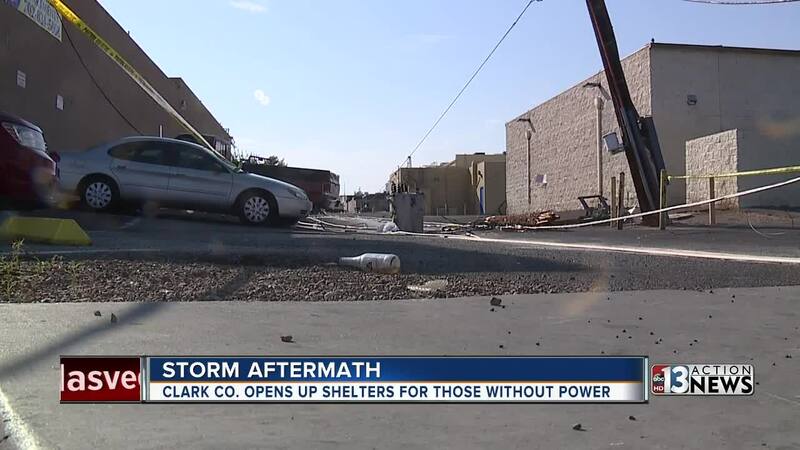 As shelters were opening up, NV Energy crews were hard at work to restore power. Crews were still at the scene of a power pole that snapped near Bruce & Fremont that cut power to area businesses and neighborhoods. A nearby 7-Eleven convenience store was closed for the day as a result, and employees were trying to save what they could. “Right now we have to throw out so much, a lot of frozen food, it's just a disaster," says one employee. In a neighborhood near Charleston and Nellis, a tree fell into the middle of the road and missed hitting a house. NV Energy says it could take up to 48 hours for all power to be restored and for cleanups to be finished. UPDATE AT 12:15 P.M. NV Energy said during a press briefing that it expects to have the power restore to the majority of their customers today. However, there could be some customers who don't have power for as long as another 48 hours. Currently, there are about 9,500 customers without power. NV Energy also said that this is the biggest power outage they have ever experienced and their crews are working around the clock. Any resident who lost power needing transportation to one of these shelters may call Nevada 211 or NV Energy Customer Service at (702) 402-5555. The RTC will be providing transportation in these cases. Cambridge Recreation Center at 3930 Cambridge Street, open till 8 p.m.
Pearson Community Center at 1625 West Carey Ave. in North Las Vegas, open until 8 p.m.
Walnut community Center at 3085 N. Walnut Road, open 11:30 to 8 p.m.
Winchester Community Center at 3130 McLeod Drive, open until 8 p.m. The Clark County Office of Emergency Management is evaluating whether there will be a need for overnight shelters. Pets are accepted at the shelters if they are in a carrier. There will also be a mobile pet shelter at Cambridge for pets without carriers. 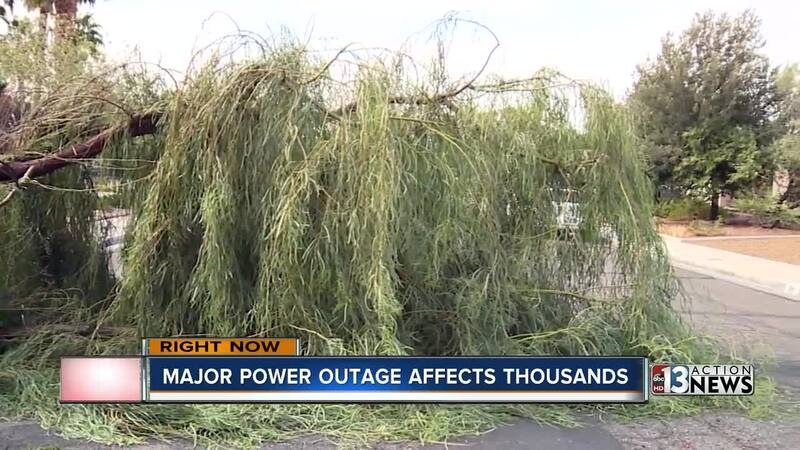 There are currently 10,234 customers without power in the Las Vegas valley. UPDATE AT 9:30 A.M. NV Energy says it has 11 crews working on the outages and are bringing in extra crews from Rocky Mountain Power (their sister company) as well as crews from northern Nevada. The spokesperson for the company says power may not be restored by the end of the day and it may be a while for some customers. The company is planning to give more information around 11:30 a.m. or noon. There are currently 13,546 customers without power. UPDATE AT 9 A.M. Power has been restored to more than half of the customers who lost power during a powerful storm on Sunday night. There are now approximately 22,000 customers without power. 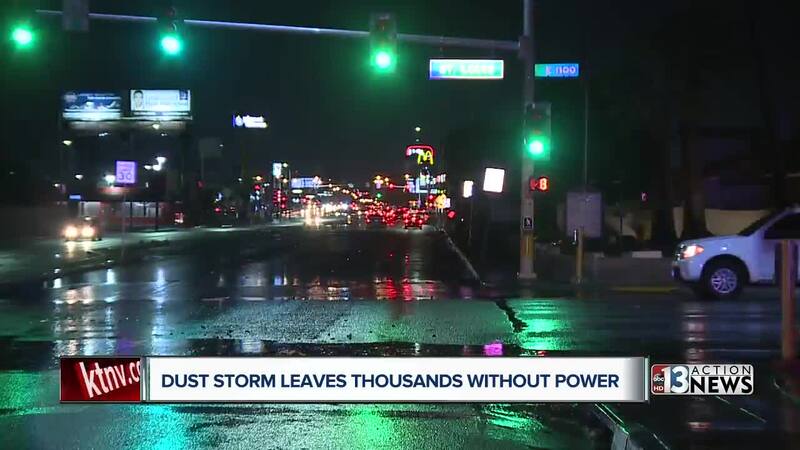 UPDATE AT 5 A.M. AUG. 12: There are 175 outages and almost 35,000 customers without power on Sunday morning after the monsoon storm on Saturday night. NV Energy is not providing an estimated time of restoration for any of the outages. 13 Action News is receiving reports of damage from the storm from around the valley. NV Energy is reporting more than 62,000 customers are currently without power. Click here for information on current outages. The storm also forced the Las Vegas 51s to suspend their game at Cashman Field. In addition, a fire near Maryland Parkway and St. Louis Avenue may have been caused by a lightning strike. Tonight's high winds have caused multiple outages throughout southern Nevada. We are working to restore power as quickly and safely as possible. We apologize for the inconvenience. If see a downed power line, please stay away and call 911. The National Weather Service in Las Vegas has issued a * Flash Flood Warning for... Northwestern Mohave County in northwestern Arizona... Central Clark County in southern Nevada... * Until midnight PDT/midnight MST/. * At 901 PM PDT/901 PM MST/, Doppler radar and automated rain gauges indicated thunderstorms producing heavy rain across the warned area. Up to one inch of rain has already fallen. Flash flooding is expected to begin shortly. * Some locations that will experience flooding include... Las Vegas, Henderson, North Las Vegas, Boulder City, Las Vegas Bay, Nellis AFB, East Las Vegas, Green Valley, Paradise, Railroad Pass, and Willow Beach. Additional rainfall amounts of one to two inches are possible in the warned area. This includes Interstate 15 in Nevada between mile markers 60 and 68. The National Weather Service in Las Vegas has issued a * Flash Flood Warning for... West central Mohave County in northwestern Arizona... East central San Bernardino County in southern California... South central Clark County in southern Nevada... * Until 1130 PM PDT/1130 PM MST/. * At 835 PM PDT/835 PM MST/, Doppler radar indicated thunderstorms producing heavy rain from Cottonwood Cove to Searchlight. Flash flooding is expected to begin shortly. * Some locations that will experience flooding include... Bullhead City, Laughlin, Searchlight, Katherine Landing, Needles, Mojave Ranch Estates, Mohave Valley, Cottonwood Cove Campground, Big Bend Rec Area, Highway 95 And I-40, Mesquite Creek, Cottonwood Cove, Cal-Nev-Ari and Willow Valley. This includes Interstate 40 in California between mile markers 131 and 132, and between mile markers 134 and 138.